Six hundred years after The Outbreak, the human population stand side by side with the Fae & the Vampyrs to stop the Demon King from starting a second Dark War. Seventeen year old Adelaide Tate is in her last year of the Academy, with her eyes set on becoming part of the Red Guard. Who cares that no female has ever joined? When a dark force develops an unhealthy liking for her, Adelaide needs to fight for her life and figure out what makes her so different from the others. She must overcome it all in order to turn her world the right way around again. Adelaide has one choice. Accept the help offered to her by Xander Bane, or face the Demon Hoard alone. One thing is for sure. The descent will be bloody. I am not a big fan of the young adult genre; as a matter of fact, I deliberately stay away from it. 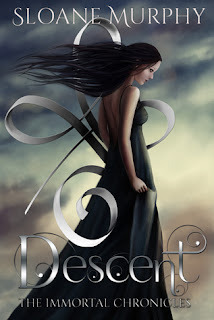 So how did I end up reading Descent by Sloane Murphy? Well, I received a copy as part of Blind Date with a Book hosted by The Quirky Bibliophile. I kept wondering will I enjoy this? What have I gotten myself into? When I realised that the story was of a paranormal nature my anxiety eased somewhat. Now that I am at the end of my journey, I can say without a doubt that this was one of the best blind dates that I have been on. The story started out slow and it took me some time to get into the book. When I eventually did, oh what a ride it was. There was sufficient action, drama, mystery and romance to keep me thoroughly entertained. I was introduced to a fascinating world where fairies ruled. The world in which humans once dominated was dying as a result of the dark war initiated by the Demon King. The fairies and vampyrs had joined forces to defeat him and he is now exiled as a result. There is tension as a result and another war appears to be brewing on the horizon. I found the female protagonist, Addie, intriguing. She is determined, fearless, feisty and strong-willed. Her desire was to become a member of the Red Guard. If successful she would be the first female to accomplish such a feat. She dedicated herself to proving her worthiness for such a position. She would come to learn that all she had grown up believing was a lie. Added to that she would experience the loss of one friend and the sting of betrayal from another. Who can she trust? It was evident that Addie was different from her peers, but what was not clear was what made her stand out from the rest. The answer to this could be found in the vampyr, Xander Bane. Xander is an original vampyr and owner of the Academy that Addie attends. He has been Addie’s protector from birth, however, she was not aware of this fact. Over the years he has developed feelings for her but he refused to act on these feelings as he considered it to be forbidden. But how long can he keep his distance, especially with the underlying threat of him losing her to someone else? This is the author’s debut novel and I found to be an interesting read. The story was told from alternate POVs. The twists and turns had me guessing from one moment to the next. The twist at the end was a shocker. With an ending like that, I can’t wait to see what is going to happen next. There is so much to this story. It’s more than just a story about paranormal beings. It speaks of deceit, secrets, betrayal, friendship, love and family. All these themes are interwoven together made for an interesting read. Great start to a new and exciting series.